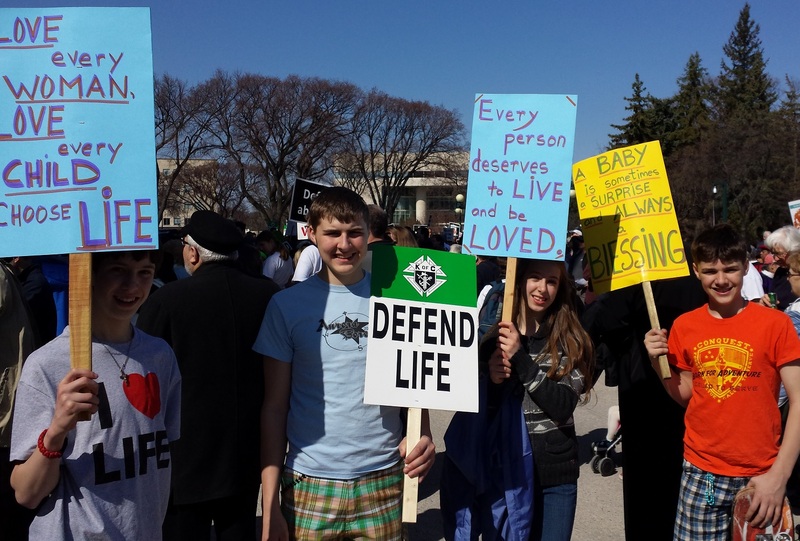 This year’s March for Life was as beautiful an event as ever – with two significant aspects: the sunny weather and the overwhelming amount of young people in the march and on the podium. It was an experience of great hope. Young people – especially university students from Winnipeg and Brandon amazed the crowd with their accomplishments, their erudition and their dedication to overcoming the St. John Paul called the “culture of death” in Canada. The crowd gathered in front of the Manitoba Legislative Building in Winnipeg on Saturday, May 10, 2014. The march moved out by 9:30 am down Memorial Boulevard toward Portage Avenue. After continuing East on Portage the long line of praying, singing and chatting people made its way back to Broadway and back to the steps of the Legislative building. 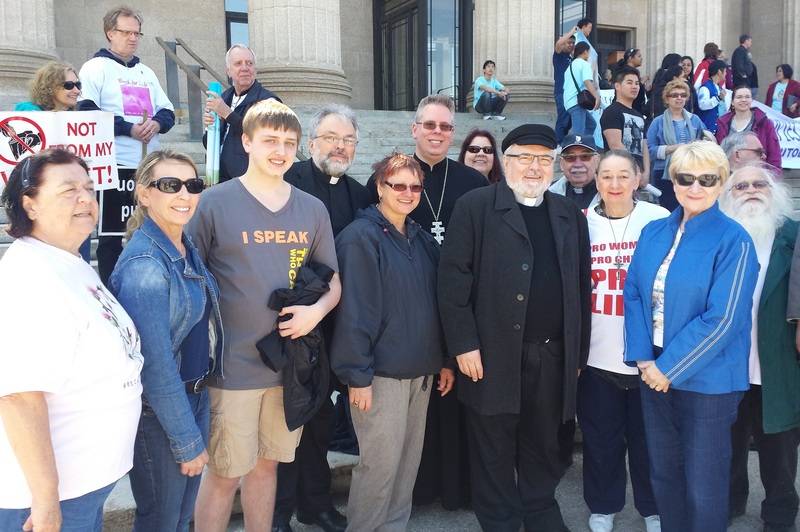 There the marchers heard well-prepared talks, testimonies of those that experienced the tragedy of abortion, as well as encouraging reports of the extraordinary successes of the pro-life effort in Canada. All three of Winnipeg’s Catholic Archbishops were there and took full part. Our Metropolitan Lawrence Huculak was joined by two Roman Catholic Archbishops: M. Rev. Richard Gagnon of Winnipeg and M. Rev. Albert LeGatt of St. Boniface. These three hierarchs were joined by a number of clergy, women religious, seminarians and a large crowd of laity. Other Christian denominations were represented as well as other religious groups. One of the heroes of the day was V. Rev. Eugene Rudachek, a now retired Ukrainian Catholic priest who still came out to this year’s March even though he participated in a wheelchair. Fr. 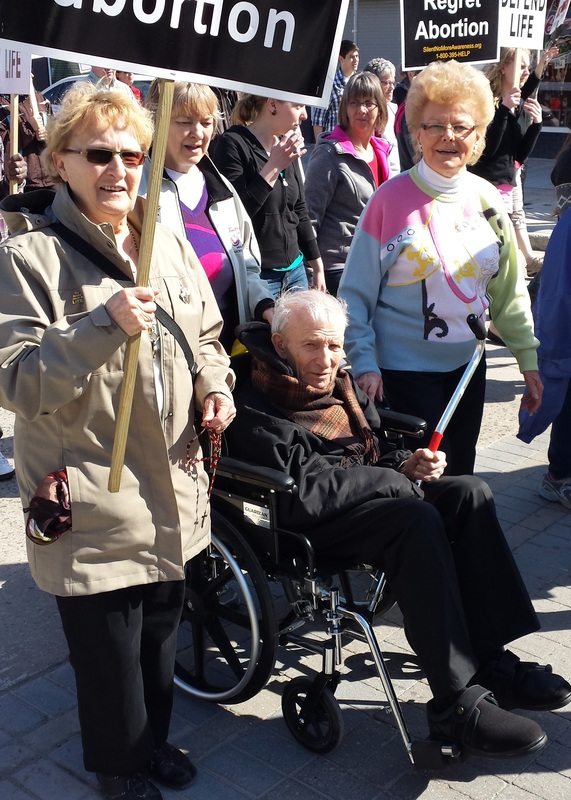 Eugene is often known as “the father of the pro-life movement in Western Manitoba”, as he was one of the first activists at the front of the movement in the 1970s while he served as parish priest of Brandon, Souris and Rivers. Many of the speakers were presidents or representatives from university-based pro-life groups. They really encouraged the crowd by their enthusiasm and conviction that the tragedy of abortion would come to an end in their day! So many young families with children! Many teens! They made everyone feel young and confident! The Knights of Columbus were out in force with many councils represented. The chief organizer and coordinator for the day was former Manitoba State Deputy, Brother Merlyn Onyschuk. Members of the Ukrainian Catholic Women’s League were there along with their Archeparchial President, Mrs. Pat Sirski. Many other organizations were present and visible with banners and placards. A good number of Ukrainian Catholics were visible in the crowd! Holy Eucharist Parish? Yes, we were there with our parish priest Fr. Michael Kwiatkowski. God bless everyone who came out to support this all-important cause!